Bank Nifty opened higher at 25145 and bounced further by more than 200 points to register high 25367 and finally closed 263 points up at 25321. Friday, I mentioned 25248 was breakeven point for upside above which Bank Nifty can bounce further towards 25517 and above in coming days. I also suggested If someone bought Bank Nifty 24900 Call 14 Dec expiry then same can be hold with stoploss of 24953 expecting minimum target 25200 which further can extend towards 25517 if breaks above 25248. Bank Nifty opened at 25145 and bounced till 25367 and 14 Dec 24900 call also bounced from 338-458 and finally closed at 443. Now, we need to analyze latest charts for next move. This is 5 Hourly time bar chart of Bank Nifty covering move from low 23611. This is same chart which I posted in yesterday’s report because there is no change in wave counts on this chart. It seems wave completed from 23611-24872 may be wave (A or 1), wave completed from 24872-23916 may be wave (B or 2) and wave completed from 23916-25953 may be wave (C or 3). There are confusions on this chart because wave is overlapped and inner waves of (A or 1) are not clear. On the other hand, we are not clear if wave (B or 2) is Irregular Correction or not. So, I am ignoring this chart for a while and will concentrate on the pattern of decline started from 25953 for short term moves. Now, we need to analyze the decline started from high 25953 on separate lowest possible time frame chart. This is 15 Minute time bar chart of Bank Nifty Covering move from high 25953. 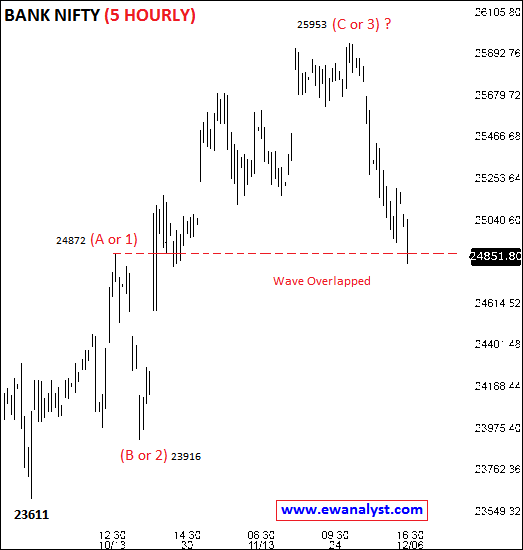 It seems wave completed from 25953-25797 may be wave (i), wave completed from 25797-25873 may be wave (ii), wave completed from 25873-24947 may be wave (iii), wave completed from 24947-25217 may be wave (iv) as Irregular Correction and wave (v) may be completed at 25813. 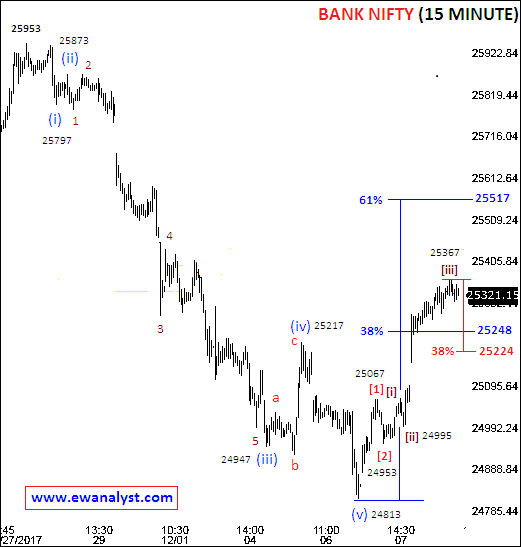 Overall wave completed from 25953-24813 may be wave (A or 1) or wave(C) of Irregular correction. 38%-61% retracement of this whole impulsive decline (from 25953-24813) is placed at 25248-25517 which is the possible target range on upside whereas 25248 is already completed. And from low 24813, it seems a small impulse completed at 25067 may be wave , wave completed from 25067-24953 may be wave  and wave  may be in progress from 24953. And within wave , it seems wave [i] may be completed at 25069, wave [ii] may be completed at 24995 and wave [iii] may be completed at 25367 or still in progress. 38% retracement of the wave [iii] is placed at 25224 which is referred as breakeven point and same can be used as stoploss for any longs taken. Bank Nifty bounced by more than 500 points from low 24813 within last two trading days and still has possibility to bounce further towards 25369-25517 which can extends towards 25953. And 25280-25224 is the range where Bank Nifty can find support for further bounce towards 25367-25517 which can extends further for new high above 25953. 25224 is the breakeven point for downside and same can be used as stoploss for any longs. Outlook of Bank Nifty is positive as it is breached above 25248, so trading strategy must be Buying on Dips expecting upside target 25517 and 25224 as fresh breakeven point. Those who are holding BN longs or 24900 Call can used 24189 (some points below 25224) as fresh stoploss. Any decline towards 25248-25224 can be used to buy fresh 25100 Call of next weekly expiry with exact stoploss 25189 expecting targets 25367-25517.